How else can a reasonable person describe it? Consider the facts established in Eagle County District Court – specifically in Judge Moorhead’s Courtroom: Defendant found guilty of drunk driving (0.189) and guilty of Vehicular Homicide in the killing of a young man – Lewis Cook III. David Perzanowski hit and killed Mr. Cook with the car Perzanowski was driving while Perzanowski was legally drunk. Perzanowski admitted to his crime. In October, 2011 (Click Here) Perzanowski was sentenced by Judge Moorhead to 4 years in Prison, the minimum sentence for Vehicular Homicide under Colorado law. As is every criminal defendant’s right – the defendant can file (they did) a motion within 120 days of sentencing, asking the Judge to reconsider his original sentence. Per their filed motion, Judge Moorhead reconsidered his original ruling last week. David Perzanowski, will now walk out of Eagle County Jail a free man on Wednesday, February 15th. Perzanowski sentence reduced to 6 years supervised probation and alcohol treatment. What is Judge Moorhead’s singular message to Mrs. Susan Cook – the mother of the Victim? Answer: Mrs. Cook your son’s life isn’t important. What is Judge Moorhead’s message to our Community at large? Answer: It’s O.K. to have a second alcohol related offense, kill someone while driving drunk and then essentially “walk”. Your sentence? Not that much different from the typical sentence for a first time DUI. District Court Judge Thomas Moorhead is a menace in our Community. What can a reasonable person do about this? 2 – Judge’s have to be re-elected to retain their seat on the bench. Save this ECT report and tell you friends it is absolutely essential to vote against Moorhead’s retention the first chance you get! 4 – If you have a new civil case filed and got Moorhead as your Judge – drop your case and re-file elsewhere. 5 – Stay (at all costs) out of Moorhead’s Courtroom. If you get called for Jury duty in Moorhead’s court, do whatever is legally possible to make sure you don’t have to sit in the same room with this Judge for any reason at any time. 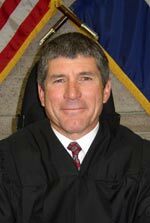 Fact is: Judge Moorhead is no stranger to Drunk Driving having rolled and wrecked a Town of Vail assigned Saab automobile. On April 2nd 1994 the (then) Town Attorney for the Town of Vail (Tom Moorhead) was arrested and charged with Drunk Driving. (Click Here) Did this fact have anything to do with Moorhead changing his mind about his original sentence? You decide. The ECT extends our sincere condolences to the family and friends of the victim, Mr. Lewis Cook III. In a sense District Court Judge Thomas Moorhead has made our entire Community a victim of his personal Miscarriage of Justice. Your actions are a disgrace, Thomas Moorhead. Note: Comments made to the ECT folks about Judge Moorhead – by both the District Attorney’s office and local Criminal Defense lawyers contributed heavily to this ECT report. Moorhead can’t tell the difference between a Priest and a Judge. Priest’s render forgiveness for sinners who genuinely repent. Judges are assigned the task of sentencing those found guilty of crimes. Judges have guidelines to help them do that. Moorhead is clearly not up to the task his job requires. We agree ECT, Moorhead has to go. If you are going to call someone a disgrace you should at least have the decency to sign your name to it. We all know who you are anyways. ECT folks not the ones causing the problems in our Community. ECT folks are the ones pointing them out. If you are more upset with the ECT, than with the Judge that caused this Miscarriage of Justice – the ECT folks can’t help you. ECT suggests you stop reading. The ECT’s moniker at the top of our online newspsper reads “The ECT is dedicated to informing people who have to think for their living”. Which group do you represent Zach? Who was the defense attorney. Perhaps a special relationship to Judge Moorehead? Answer to your question in the extensive [Click Here’s] contained in the ECT report. Answer: Defense Attorney – Terry O’Connor. ECT was told Perzanowski wanted local criminal defense attorney Jim Fahrenholtz but couldn’t afford Jim. O’Connor allegedly a ‘court appointed attorney’. ECT cannot confirm, nor deny any alleged “special relationship” between O’Connor and Moorhead. It’s fine to question the wisdom of the judge’s decision or the legal precedence for it. While I’m sure he had his reason, I too am a bit confused. However, to call a public servant a disgrace from behind a pseudonym seems a bit cowardly. Why don’t you ask the judge why he made his decision? That would be doing us a real service. ECT agrees there needs to be a follow-up. ECT was advised that the Court transcript of Moorhead’s most recent ruling may contain some answers. ECT folks researched this crime/ruling extensively – and we can FIND NO legal reason for Moorhead to VIOLATE legally established ‘sentenacing guidlines’. Moorhead’s original ruling was consistent with those guidlines. ECT folks not interested in “a pound of flesh” in this case, ONLY that established rules are followed to the letter. It’s Moorhead’s job to follow those rules, not to violate them. If Perzanowski violates this six year probation agreement and does not go through the proper treatment program monitored by Judge Sullivan, he will have to serve 16 years in prison, without the possibility of community corrections. This sentence gives him a chance to reform, and if he doesn’t reform, he will serve 16 years and not 4. ECT: Sandy please read the story again. Point is…this is Perzanowski’s SECOND drunk driving offense. If reform was/is on Perzanowki’s mind – how did he get in trouble a SECOND time? This guy belongs in Jail….for a long, long time. Our Community and roads would be much safer. What happens if Perzanowski – just skips town? What then? More drinking and driving after a (name change?) in some other State?